Gina practices occupational therapy at UW Health. She specializes in treatment of patients with hand to shoulder orthopedic conditions. Gina sees patients upon referral from all medical providers. 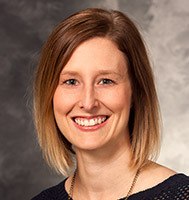 Gina holds a Master's of Science degree in Occupational Therapy from the University of Wisconsin-Madison, and a Bachelor of Science degree in Therapeutic Recreation with a minor in Psychology from Winona State University, Winona, MN.